I have the best job in the world, y’all. Not only do I get to sell kitchenware and talk about food all day, but I work with a group of people who love food just as much as I do. A few times a year my boss organizes work events and parties, and they usually revolve around food (and drinking), and everyone in the store gets involved. Most recently, to celebrate the warm weather and sunshine, she invited us to her home for a seafood boil. I wish you could see the email chain with never-ending menu planning notes, logistics and to-do lists. I seriously LOVE my job. The spread included a huge cooler full of crawfish flown in from Louisiana and a giant bag of 300 littleneck clams, along with seafood stew, boiled corn, potato salad, vegetarian paella, homemade caesar salad, lemon bars, key lime pie, beer, wine, & vodka spiked lavender lemonade. My contribution was a giant skillet of cornbread, a blueberry cornmeal cobbler, and coleslaw. Amazing coleslaw. This coleslaw. 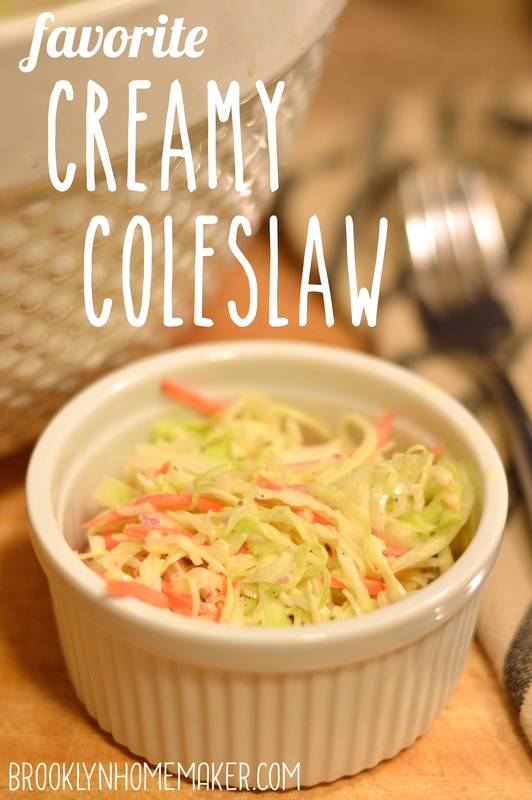 I know coleslaw is an afterthought for most people, but I really love it. Like, a lot. Especially when it’s done right. I’m the kind of guy that eats, or at least tastes, the coleslaw every time it comes on my plate. 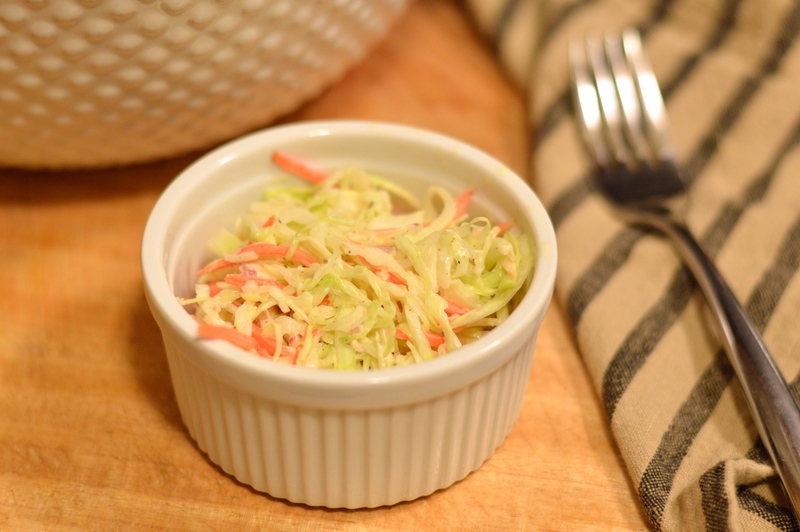 For years I’ve struggled to find a classic homemade coleslaw recipe that I really loved. This time I finally got it right. 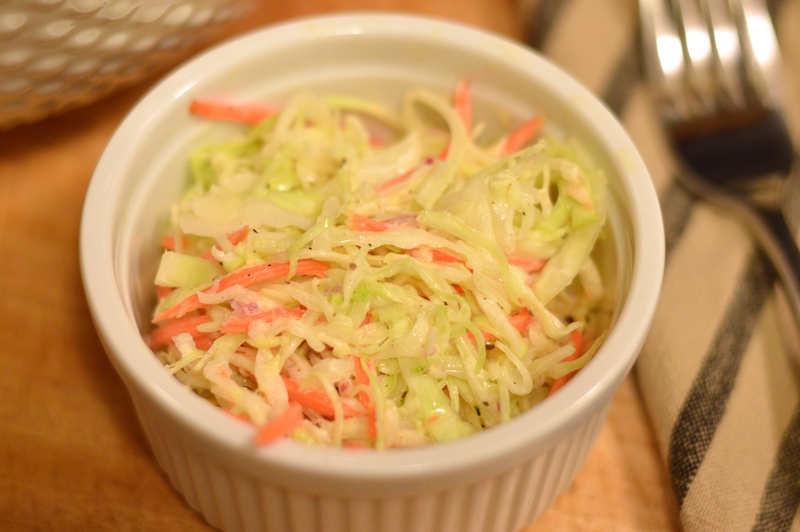 I swear this might be the only coleslaw I ever make for the rest of my days. Probably not though. I can’t leave well enough alone. Anyway, I’ve tried a ton of different recipes and none of them ever seemed to live up to my hopes and expectations. I’ve adjusted the levels of mayonnaise, vinegar, sugar, & seasoning. I’ve experimented with different types of cabbage, and different shred sizes. I tried using celery salt, onion salt, mustard powder, flavored vinegars, you name it, but nothing I tried ever tasted quite right. 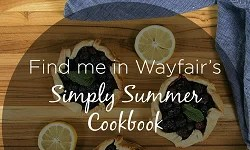 This time I went back to the basics and started with a simple classic recipe. 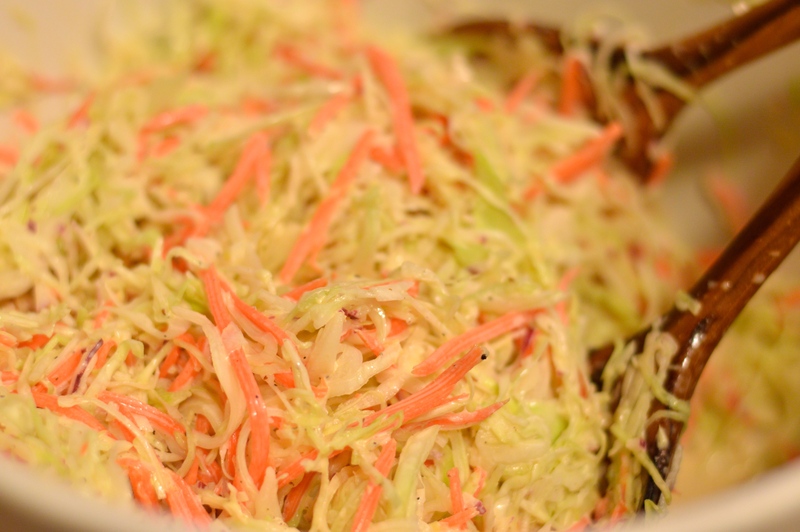 Plain old white cabbage and carrots with mayonnaise and vinegar, but with just a few little twists. I used apple cider vinegar rather than white vinegar because it has a bit more flavor and a nice subtle sweetness. I substituted celery seed and finely diced fresh celery instead of celery salt, and it made huge a difference, bringing an unexpected brightness and fresh summery flavor. I used some finely diced red onion for a subtle bite, and added a bit of dijon mustard for some depth and a tiny hint of spice. The sugar and salt are just enough to bring out all the bright fresh flavors and make everything pop without being overpowering. This is actually a really simple recipe to put together, especially if you have a mandoline slicer. I shredded the cabbage as finely as I could and, using the medium-tooth blade attachment, diced the celery and red onion just as fine. 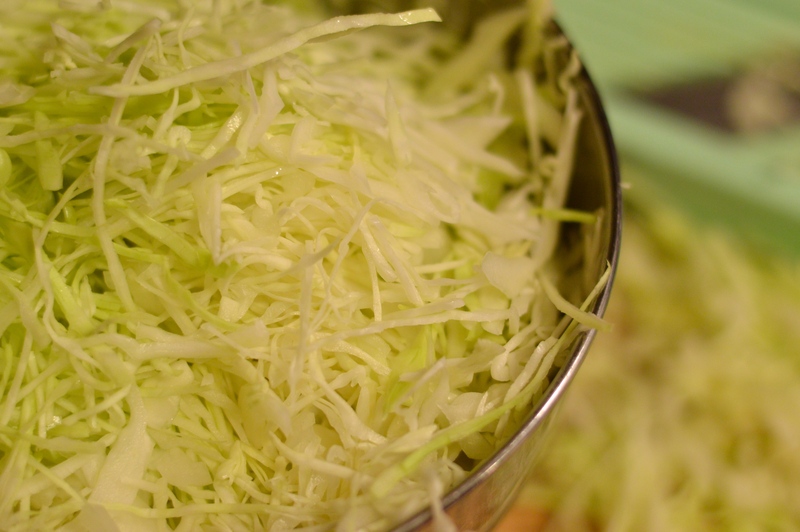 When you first shred it, the cabbage seems like SO MUCH, but once you toss it in the dressing it loosens up and compresses down. I think it’s important to let the cabbage soak in the dressing for at least an hour or two before serving, and it manages to stay crunchy and fresh even made a day or two ahead. Just a quick side note, it turns out that our dogs LOVE raw shredded cabbage. They’re so funny sometimes. I know it’s just coleslaw, but I’m really proud of myself. The dressing is totally perfect too. 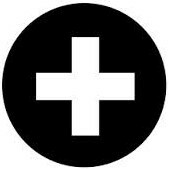 Creamy, without being gloppy or overly mayonnaise-y. Tangy, not biting or vinegar-y. 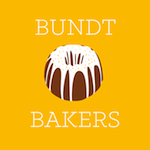 Subtly sweet, but not at all cloying. Juuuust right. Look out summer. Here I come. Prepare all vegetables and toss together in a large bowl. This can be done with a sharp knife and/or a box grater; but I used a mandoline cutter with the cabbage, onion, & celery to get perfect thin shreds, and a julienne peeler to get long thin strips of carrot. Whisk all dressing ingredients together in a medium bowl until well combined. Pour dressing over cabbage mix and toss toss toss. Cover and refrigerate for at least an hour. Before serving toss again to incorporate any dressing at the bottom of the bowl. 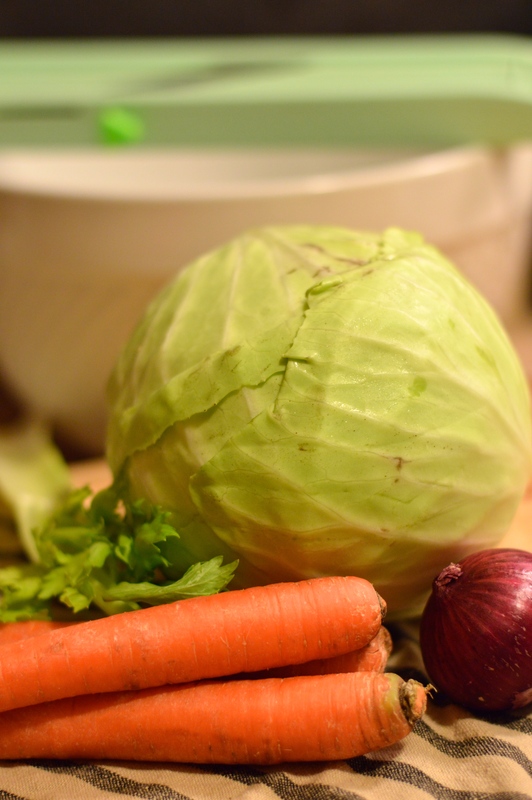 If served right away the cabbage will be wonderfully crisp, but this can be made up to two days in advance without getting too soft or soggy.